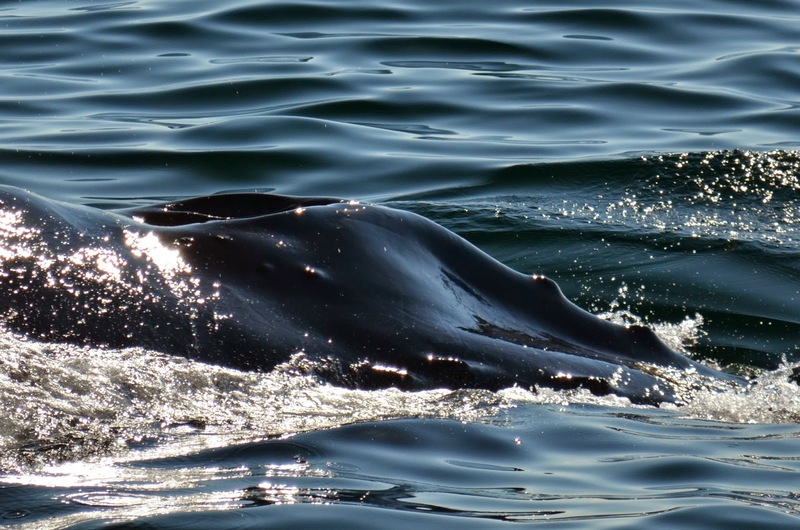 On today’s 10am trip aboard the Asteria, we headed to the SW corner in search of whales. When we arrived, we first found Nile and calf, and saw some distant blows as well. We stayed at first with Nile and her calf- who were logging at the surface right next to our boat! Nile’s calf was one tired calf today. It spent a lot of time at our trip resting at the surface, while mom would occasionally come up and also log for a bit. Nile actually spent a lot of time hanging underwater just below her calf, which was very interesting to watch. 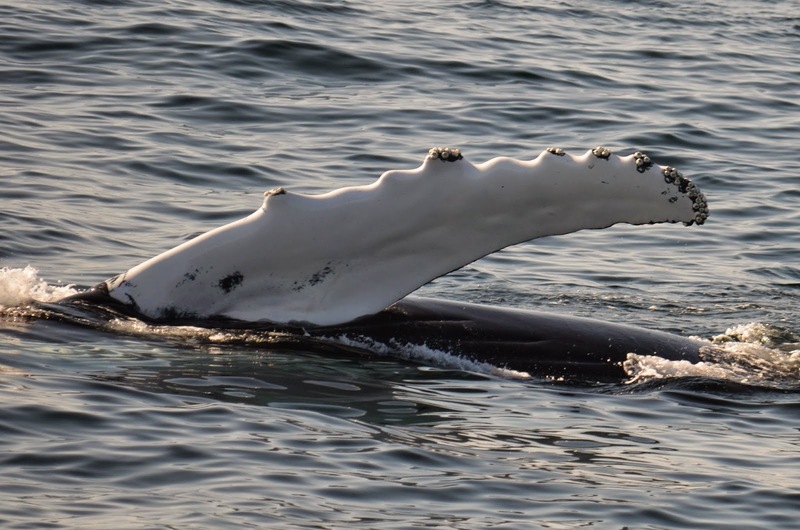 After a while, Nile’s calf suddenly started rolling and flipper slapping (see photo), followed by a quick tail breach! After this Nile’s calf appeared to wake up, and while Nile appeared to be subsurface feeding, Nile’s calf got in a quick nursing bit. The pair then began to log again, and we decided to head to the blows in the distant. 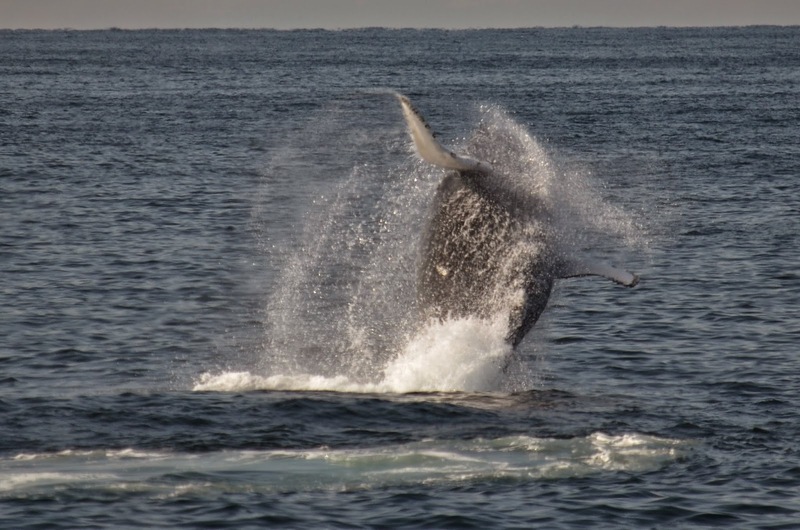 We had great luck heading to the blows which turned out to be six more humpbacks! We found four adults and a calf – Eruption, Pele, Perseid, Milkweed, and her calf. 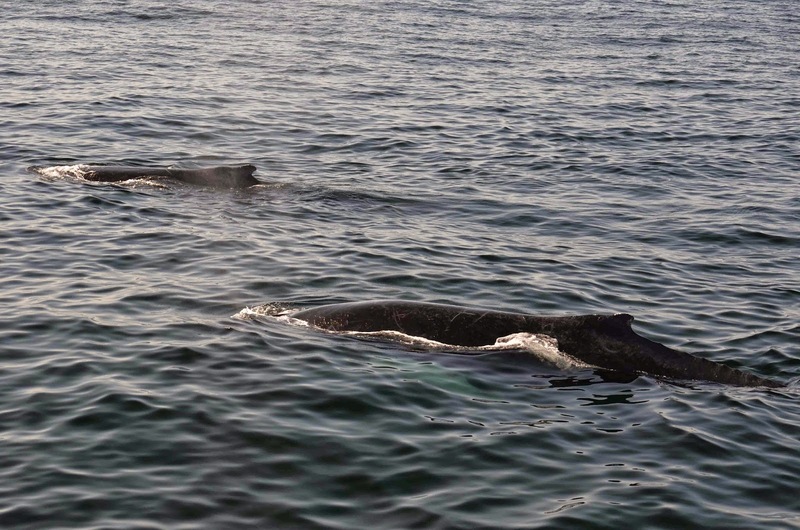 Perseid’s calf however had strayed from the group – and instead came to check us out! Perseid’s calf was quite interested in us today – which included the calf blowing bubbles around our boat and even checking us out with a spy hop (see photo)! Milkweed’s calf to seemed to also follow suit with its independence, and for a while we had both calves milling at the surface while the adults fed. Pele and Eruption split from the two moms, and we ended the trip with a nice look of Perseid, Milkweed, & their calves (rejoined with their mothers) alongside the boat. We also spotted a quick look of a fin whale on our way home. On our afternoon trip aboard the Cetacea today, we set out for the southwest corner of the bank where the morning trip had had great success. As we slowly cruised up to the area, we spotted at least three different groups of humpback whales! As we began heading for the large group of what we believed to be six whales, two whales from another group began breaching! This duo breached about 10 times in the distance but became more subdued upon our arrival. We still had gorgeous looks of what turned out to be Pepper and Pele! This duo surfaced super close to the boat and gave us gorgeous views of their flukes with each dive. We also saw Nile and her calf who appeared to be logging a few hundred yards away from us. 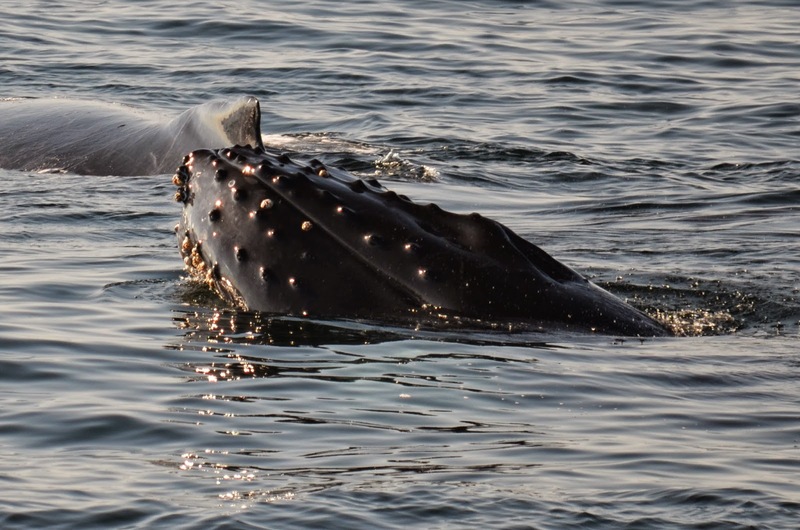 We then moved on to the larger group of six whales which consisted of Milkweed, Perseid and each of their calves plus Tear and Storm. Tear kept some distance from the others and spent most of his time resting at the surface while exhibiting occasional pectoral slapping. The other five swam around pretty randomly potentially looking for some food. They approached our boat very closely crossing only a couple yards off our bow and stern a number of times. As our whale watch came to an end, Storm began pectoral slapping and putting on quite a show which ended with three huge breaches! It was an incredible trip that started and ended with a bang! It’s amazing how much activity we are still seeing out on the bank!